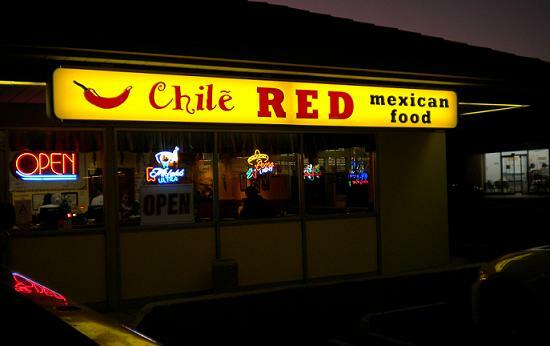 Chile Red has been a reliable fixture in the shopping plaza at the northwest corner of Base Line and Archibald since at least the mid-1990s. It’s a comfortable sit-down Mexican restaurant that does a lot of takeout. It was a newsroom hangout in ’97 when I started at the Bulletin but I hadn’t eaten there for a few years. Well, I had dinner there last week. The dining room has been redone with yellow walls and dark brown tables and chairs; the last I remembered, the tables had red-checked tablecloths. It looks good. Chile Red still specializes in burritos, touting their foot-long “killer burritos,” but they have normal-sized burritos, tacos, enchiladas and dinner platters ($8 to $13) too. I got the Chile Green burrito ($6), stuffed with chile verde pork and a smattering of rice and beans. It was a knife and fork burrito, good stuff, probably 7 inches long and 4 inches wide, and a mild lip tingler. I took home half and got a second meal out of it. My take is that while Chile Red isn’t the best Mexican food in town — contenders would be Taco Hut, El Ranchero and Los Jalapeno’s — it’s pretty good, and the atmosphere is sedate and pleasant. And by Alta Loma standards it’s practically historic. Online chatter says Chile Red has changed hands, apparently for the second time, and now is closer to the original style. Anyone else been there recently, or have memories of the place? I used to love their food and frequently stopped for take-out. Their chicken tacos were fabulous; and the family that ran it for so many years was wonderful, too. Even when I moved away from Alta Loma, I would go out of my way to stop there. When it changed hands, the food went downhill. I tried it once and havent been back. Sure would like one of those chicken tacos. I went there a couple of months ago. I had ordered a taco type salad and the lettuce was swimming in water. I drained it into an empty cup and it filled it about 3/4 of the way. A staff member asked me what in the cup and was shocked when I told her. They did not offer to replace it or anything. I also didn’t ask as I didn’t want another one anyway. It was gross and we never went back. Chile Red has actually been around at least since the late ’80s. I used to go there for lunch when I worked for the city way back when. Of course, back then, “the city” was just up the street on Base Line, too. I remember it being one of the better lunch spots, but I have to admit I’m always a little surprised each time I drive by that area and it’s still in business. Sounds like it’s had its ups and downs. It seems the big question is “When did it change ownership?” I also used to frequent Chile Red until a few years ago when it noticeably went downhill. I hadn’t heard about the new ownership in place and instead have been going to Juan Pollo in same plaza. I have a weird quest that when I see potato salad on the menu, I have to try it to see if it’s as good as our family recipe. The potato salad at Juan Pollo is as good, if not better, than Mom’s potato salad. Sorry Mom! Hey, David. I like your blog. I didn’t know Chile Red was a newsroom hangout when I went there (for an IVDB lunch review) in 1998. The chile colorado I had then was excellent — not that it matters now! OK, everybody calm down. As of today let’s just pretend they have new owners so please go by and give it a try. I love the place and I am so partial to the owner/operator concept. Sorry, they don’t have potato salad and I really wonder why it was even mentioned in the first place. I remember going there in the mid to late 80s, and it was pretty good then. While it has new owners, I believe their sign said they kept the same cook. Good thing David’s blog now has Bob Terry as the moderator. Now I can rest peacefully knowing David’s blog is in a state of calm. Sounds like someone may be a bit sensitive about Chile Red! Thanks for the closing points to Anonymous…is that a Greek name? “An $8 box of rice” is how my hubby described the little killer green chili burrito he got after we decided to try them again, thanks to your review. My carnitas smelled and tasted steamed/boiled, and therefore lacked flavor; they did, however, have noticeable oregano seasoning, but no salt. Their chips were homemade, but more than half were not crunchy, but still soft. I’ll stick to Tio’s on Lemon. The other Tio’s is Day Creek and Baseline by Henry’s. In the last few months I have been there multiple times. The staff is friendly and responsive. The chicken soft tacos are some of the best my wife has had. For myself, their burritos are large & tasty and the chips are above average. I used to go there in the ’80s and the food is very close to that previous standard.